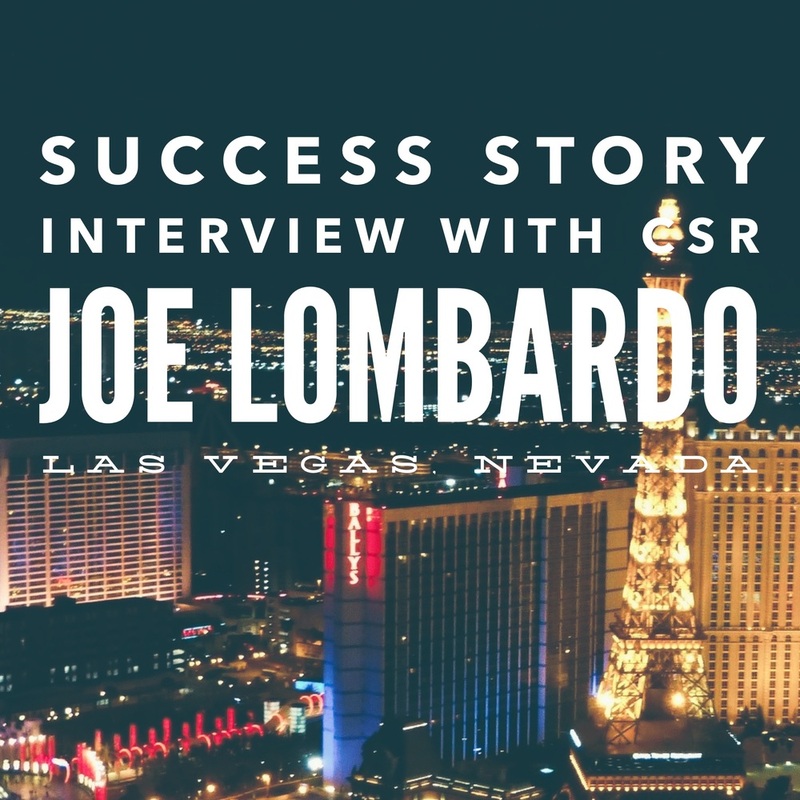 This month I had the pleasure of interviewing Joe Lombardo from Las Vegas, NV. Joe has been the CSR in two separate NCI Plan 2 programs in the Las Vegas market and he was able to accomplish fantastic results for those firms. Read on to gather some insightful tips into running an NCI marketing program. Tell me about your sales background prior to becoming a CSR for the first time. I’ve been in sales and marketing since I graduated from Buffalo State University. I initially started out in the insurance business and eventually became an independent property and casualty insurance agent. I did that for many years. Then, when telecom became the hot new industry, I sold my insurance agency and I ended up going into that. I worked doing various things like selling long distance and local service phone systems. I eventually became a Sprint cellular dealer. About 12 years ago I relocated to Las Vegas from Buffalo. There I worked more on the advertisement side of sales doing direct mail advertising and marketing. About four years ago I had talked to Bob Shafer, who was doing interviews for Bonita Jones, an accountant in Las Vegas. They were implementing the NCI system and hiring the appointment setters and a Client Service Representative. I applied for the CSR job. When I heard about the program, I was really excited. When you’re a sales rep, if you’re really excited about a product you can sell it much more effectively than a product you don’t have much faith in. Prospects will pick up on that added sincerity. Plus, based on the pricing and what you get for the price, I thought it was a phenomenal deal for any small business owner. As a matter of fact, when I had my insurance agency I wish someone had come to me with this service at this price and I would have paid it gladly. That’s really how I felt; I loved the product. I made it known that I really wanted this job and lo and behold, when it came time to choose, both Bob and Bonita ranked me number one out of the candidates and that’s how I got the job. Tell me about the initial training you received from NCI and how it helped you step into the position? Initially I shadowed Bob Shafer for field training. I went through the training materials and the presentation and worked to commit that to memory. Then, we went out and he showed me what to do. He was really smooth; he was very good when talking with clients. Then, we transitioned to me presenting the service, with Bob critiquing my performance. Although I had a strong sales background, it was still an adjustment to sell a new product following a new system. Over time, in selling the service, I internalized the presentation to the point where I could recite it in my sleep. It made my job a lot easier. Aside from your training and your belief in the product you were selling, to what else do you attribute your success as a CSR? When you’re in sales it’s really a just a process, regardless of what you’re selling. You need to follow the process. The NCI process starts with the appointment setters. It’s a numbers game. I worked the territory a certain way. People in Vegas don’t like to travel much; they just don’t. So I specifically targeted businesses very close to the office location at first and we fanned out from there. It sounds simple and it is, but you have to do it. I think that applies to the whole NCI program. The other part of it is that you need to have a good appointment setter. If you truly want to make this work, it’s a team effort. Over the years I had certain appointment setters who I knew were good at their job. So, when they set me an appointment, I knew it was going to be high quality and I’d have a greater chance to close that one because those prospects really had a need and had a good understanding of why I was coming to their business. Good-quality appointments are extremely important. Approximately how long did you work for Bonita Jones? I was with Bonita for a short time, only about six months. In those six months we brought on about 60 new accounts. It was nuts. How much in billings did those additional 60 clients represent? Bonita called me into her office one day and I could tell it was not going to be good news. She told me that they were going to shut down the marketing program because she was going to sell the practice. I told her this is the first time I’ve been let go because I did too good of a job! So I called NCI and spoke with Bruce Clark. He told me that NCI had an accountant in Vegas who wanted to do the program but wasn’t quite ready to start yet. I told Bruce that it wasn’t just me who was available but also my two appointment setters and that we could start work immediately. Bruce then used that as an added incentive for Adam to start the program sooner. So Adam rushed to get an office set up to facilitate starting the program, but we made it work. There are a lot of people out there who believe the NCI program only generates very small- paying clients, to counter that, what are some of the higher-paying clients you remember from your time as a CSR? The average client I signed was around $200-$300 a month. We had a couple on the larger side, though. I remember one; I think it was a management company that was paying about $750 a month, which included some additional service above and beyond the standard monthly package. What about back work? Were you able to secure some good back work from the clients you signed up? Another time I think this was when I worked for Adam we had a company that had six or seven year’s worth of back work and back taxes. Adam did eventually get them up to date. That’s quite a story and I’m sure a lot of our readers will be able to relate to that kind of thing. I honestly think and this is my opinion that a lot of these business owners, especially when they have a lot of back work, are so embarrassed to let me know. They are embarrassed that they let it go that far. That’s why I try to put them at ease by telling the story about the guy who hadn’t filed taxes for six or seven years and how we were able to help them. That’s great; it makes them feel better about the situation while demonstrating some of the value that the service can provide. Exactly. All of a sudden they are opening up about being a year or two behind. The vast majority of prospects are going to have some form of back work. They will eventually agree to have the work done if you can agree on a price because they didn’t do the work before, so what makes you think they’re going to do it now? Right. Sometimes they don’t want to bite the bullet and pay the extra money. I think that the accountants I worked with are pretty fair and reasonable when it came to pricing the back work. They had to make their money but they didn’t want to starve anyone either. I think that’s really important to stress. You often have to make concessions on back work, sometimes because the amount they need to pay is usually very large, larger than a small business can reasonably handle without it affecting the business negatively. So you have to spread the payments out and/or give a discount to get the business. I know of some accountants who are not willing to concede at all and I think it ends up costing them a lot of business. I think that is being penny wise and pound foolish. You may take an upfront hit on the work but by helping a client dig out of a hole like that you will build loyalty and have a good-paying client for many years to come. You’ll make the money back in the long run. I know a lot of CSRs struggle with signing large amounts of back work; do you have any additional tips on handling that? For a decent amount of back work, we had a simple formula to determine the fee. If the amount got exceptionally large, the accountants I worked for told me to bring in the paperwork so we could develop a fair quote for both parties. They were willing to discount the work and also work out a payment plan for the client to make it manageable for them. So I can use that when I talk to future prospects to let them know we will work with them to get it taken care of. When they hear that, they feel a little bit better. That has to be worked out with the accountant beforehand, though. That makes sense and I think that is what works for most firms having success. What was your most successful NCI closing technique? I used to talk to the prospects about becoming an S-Corp. Alot of them were DBAs or C-Corps and things like that. I gave them the example, especially if they were not an S-Corp or an LLC being taxed as an S-Corp. “If you have x amount of dollars coming in and you take a reasonable salary for the work that you do, we would tax it out this way. Then if you took the balance of the money as a distribution of earnings, which would not be subject to FICA and things like that, I show them quickly and easily how they could save thousands of dollars by simply becoming an S-Corp. They didn’t know that. Bob Shafer loves that close and I picked it up from him during training. I have heard the same thing from other CSRs that Bob has trained. You are demonstrating knowledge and value to the prospect. Right, and I would ask people, how do you pay yourself? They would give me their answer. I used to say to the prospect, don’t tell me what you made; it’s not my business, so let’s pick a number out of thin air. Let’s say you made $50,000 last year, here is how you’re going to be taxed on that and here is the amount of tax you will pay based on $50,000. Now, if you are with us and we help you become an S-Corp, you only have to pay this amount. Then I went on to say that this is only one thing that we as professionals know and bring to the table. That’s just one thing and I’m not even an accountant! Imagine all the things the accountant will know that you probably are not aware of. I like the example that if you are presenting to an auto mechanic you would say, “Would you let an accountant work on the engine of your car?” No, of course not, so why would you, an auto mechanic, handle the financial and accounting side of your business? Let the professionals do the work they are trained to do. It’s well worth it. Do you have any other advice for any CSRs out there currently working to sign up new business? One thing I try to do is relate to prospects on their level. If I’m talking to a business owner and he’s very formal and wants to do all his due diligence, I will follow his example and mirror him to an extent. If I’m talking to a mechanic, they do things a little differently; I’m going to try to relate to them on their level and speak their language. You have to be a chameleon. It makes you much more relatable. I have to know how to read and relate to people. Do you have any advice for our accountant clients reading this about the CSR/accountant relationship and how to maximize the benefits of that? “Are you kidding me?” You don’t know how many customers I brought on that fell off because no one in the office was in charge of following through with them. The most important advice I can offer is to have someone internally at the firm who is responsible for making sure that each new client is brought into the fold in a timely manner. So when this happens I would get a charge back [losing the commission for signing the client] because the client didn’t pan out. That’s not my fault, I did my job and brought them in the door and now I’m being penalized. It’s demoralizing for a CSR. I also could usually pick up the phone and have the supposedly unreachable business owner on the line within ten seconds, who then tells me they never heard anything from the firm so they decided to go with another accountant. A lot of times, when I would ask about a new account being contacted, the accountant would tell me, I’ll email them. That is not enough. You have to call the new clients. That was my biggest frustration and all the accountants I worked with seemed to struggle with it to some extent. I’d like to thank you for your time on the phone today and for your valuable insight. I’m sure that many of our readers will find this information very useful.